Watershed® drybags have durability built into each fiber. 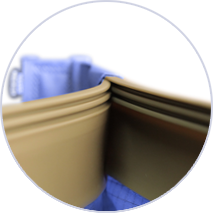 Learn more about the superior construction of our drybags. Unlike many bags that zip, snap, or roll, our drybags seal shut like a freezer food storage bag — except with a lot more grip and power. 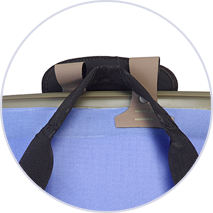 Bag closures lock shut to form an airtight and watertight seal that can endure up to 300 feet of underwater pressure. Most drybags on the market today aren’t built to last. Coated in cheap PVC, they wear out quickly and become stiff in cold weather — not to mention, they release toxic fumes into the environment. 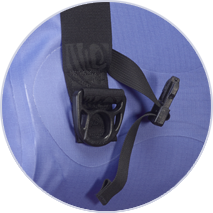 We use polyurethane-coated fabric, which is chemically stable and provides five times the abrasion resistance of PVC. This means that Watershed® drybags perform better and last longer than other drybags. Seams are a known weak point of many outdoor bags — they’re often the first place a bag splits, rips, and tears until it’s no longer intact. At Watershed®, we don’t just throw in an extra stitch or two to strengthen our seams. 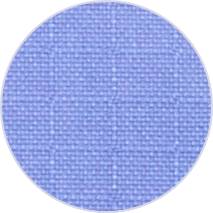 Instead, we double- and triple-layer our fabric at meeting points and weld joints together with high pressure radio waves. 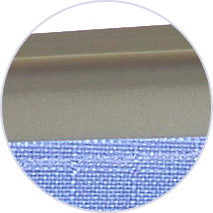 This creates an ultra-strong seamless bond built to last through the toughest conditions. Watershed® was created by river guides more than 20 years ago. Frustrated by the lack of drybag options available to them, they meticulously crafted one that met all of their needs. Today, the Watershed® team continues to obsess over every detail of our bags so that they solve every outdoorsman’s problems. Design features like multiple lash points, compression straps, a wide opening, and comfortable straps ensure that your drybag never feels like a burden. Like we said, we’re obsessed with water. We inspect every single bag before we sell it, making sure it meets our highest standards and is 100% leak-proof. We know that keeping your gear dry during an outdoor adventure can be a matter of survival, safety, and fun. So go ahead and get out. We’ll help you stay dry.